STUDY: One-Third Of Facebook Users’ Friends See Their Posts, On Average. This in from one of my favorite Social Media Guru’s and frequent contributor to “AllFacebook” If your into Social Media this is a must read. Do yourself a favor, read the article all the way through. The reach achieved by posts from Facebook pages has been the hot topic of late, with reporter Nick Bilton of The New York Times helping to bring the issue to the forefront. 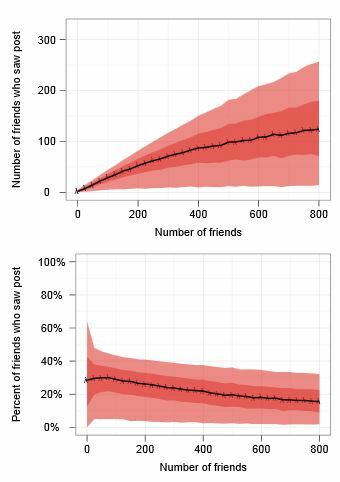 But how many of Facebook users’friends actually see their posts, on average? About one-third, according to a study by the Facebook Data Science Team and the human-computer interaction group at Stanford University’s computer science department. The New York Times’ Bits blog reported that an analysis of 220,000 Facebook users’ posts, conducted last June, showed that on average, one-third of Facebook users’ friends saw each post. The study also found that Facebook users “consistently underestimate” their audience sizes, according to Bits. Posting to a social network site is like speaking to an audience from behind a curtain. The audience remains invisible to the user: While the invitation list is known, the final attendance is not. Feedback such as comments and likes is the only glimpse that users get of their audience. That audience varies from day to day: Friends may not log in to the site, may not see the content, or may not reply. While established media producers can estimate their audience through surveys, television ratings, and Web analytics, social network sites typically do not share audience information. This design decision has privacy benefits such as plausible deniability, but it also means that users may not accurately estimate their invisible audience when they post content. We have demonstrated that users’ perceptions of their audience size in social media do not match reality. By combining survey and log analysis, we quantified the difference between users’ estimated audience and their actual reach. Users underestimate their audience on specific posts by a factor of four, and their audience in general by a factor of three. Half of users want to reach larger audiences, but they are already reaching much larger audiences than they think. 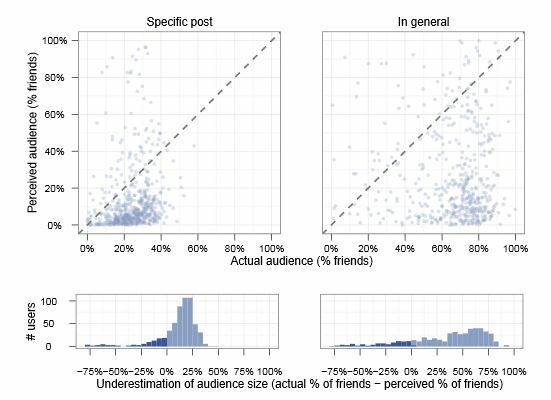 Log analysis of updates from 220,000 Facebook users suggests that feedback, friend count, and past audience size are all highly variable predictors of audience size, so it would be difficult for a user to predict their audience size reliably. Put simply, users do not receive enough feedback to be aware of their audience size. However, Facebook users do manage to reach 35 percent of their friends with each post and 61 percent of their friends over the course of a month. Stanford University Computer Scientist Michael S. Bernstein and Facebook Data Science Team members Eytan Bakshy, Moira Burke, and Brian Karrer worked on the study. Readers: What is the average percentage of your Facebook friends that you think sees your posts on the social network?